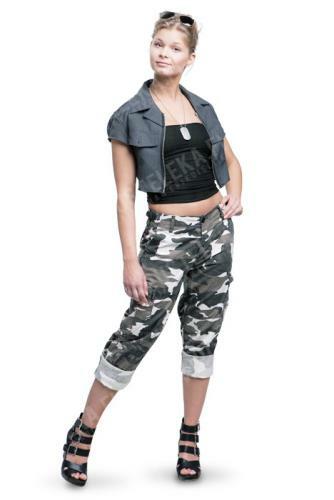 The classic BDU pants in a slightly modified cut for women. These are snug-fitting with a low waist. The trousers feature a button fly, about 40mm belt loops, reinforcing in the seat and knees, two big cargo pockets on the sides, two front pockets and two back pockets. All pockets (except the front pockets) are closed with buttons, which are covered with flaps to prevent snagging. Made of 100% cotton with ripstop reinforcing. These might shrink about 5% when washed. Very important! The sizes bear no resemblance to normal BDU sizes! We have taken careful measurements and they are announced next to each size as waist/inseam - hip. The trousers were measured flat on a table and the results multiplied by two - do the same to trousers you already own and compare, and you'll be sure to get the right size. Made by Sturm (known brands Mil-Tec and Teesar).